The compact QCS top loading autoclave by Priorclave is an ideal choice for laboratories with limited floor space seeking a versatile, highly reliable, mid-capacity steam steriliser. Built in Priorclave’s own British-based manufacturing centre, the QCS range is available in two chamber sizes of 100l and 150l capacity. 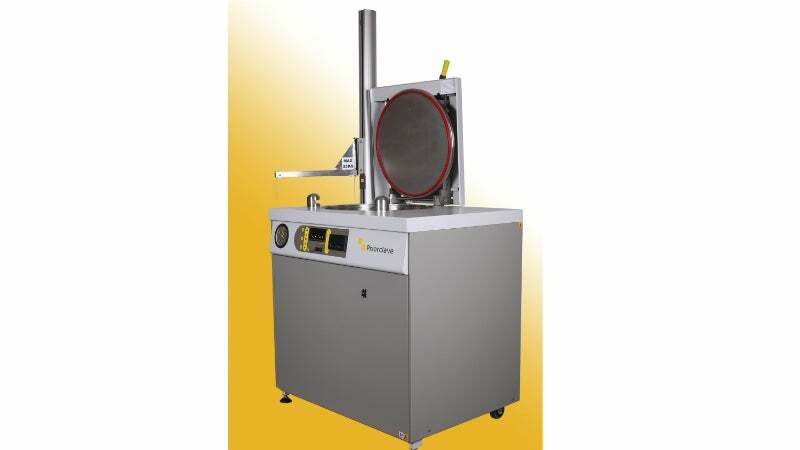 The QCS top loading autoclaves will appeal to laboratory managers in diverse industrial sectors such as food, drink, dairy, pharmaceutical, agricultural, education, healthcare, and dedicated research establishments for sterilising applications such as media preparation, liquids and diluent, waste, glassware instruments, and pieces of apparatus requiring a superior cleanse. Models QCS EV100 and QCS EV150 floor-standing electrically heated autoclaves with top-loading steam sterilising chambers are able to sterilise small and tall objects side-by-side in a single process. They easily accommodate the tallest flasks, fermentors, and bioreactors. The advanced Tactrol® microprocessor guides the user through simple step-by-step set up of sterilising parameters and keeps a log of temperature, pressure, time, and cycle data. This is held in an archive file, which can be subsequently downloaded for transmission to Priorclave’s Service Centre for technical assistance, helping fine-tune the autoclave to achieve maximum performance and efficiency. The QCS top loading autoclaves are designed to improve a laboratory’s sterilising efficiency, with features such as delayed start and media warming function for ready-to-pour media at the start of the day, forced air cooling to reduce cycle times, and automatic timed free-steaming for improved air removal. As with the majority of Priorclave laboratory and research-grade autoclaves, these top-loading variants are equipped with one of the easiest and safest, single handed door opening systems, a design developed by the company many years ago and still as practical today. This permission-based release is fitted with thermal and pressure locks to prevent opening at load temperatures above 80°C (176°F) and pressures above 0.2bar (2.9psi). The QCS EV100 and QCS EV150 top-loading autoclaves are part of the Priorclave brand, which is renowned for its superior build quality and reliability and join a comprehensive range of more than 60 standard autoclave models including benchtop autoclaves, front loading autoclaves, double-door autoclaves, powerdoors, and stackable laboratory.